Our business is focused on the production of gases, particularly hydrogen (H2) and oxygen (O2). The technological base is directly linked to hydrogen and fuel cells technologies. Our flagship project is the use of hydrogen as a storage vehicle of renewable energy, and in general, the production of renewable and high purity hydrogen and oxygen. Hydrogen, as energy vector, is aimed at storing energy to be used for several purposes such as sustainable urban mobility (automotive), power generation in industry and mining, thermal use and production of oxygen (O2) for medicinal and industrial uses. 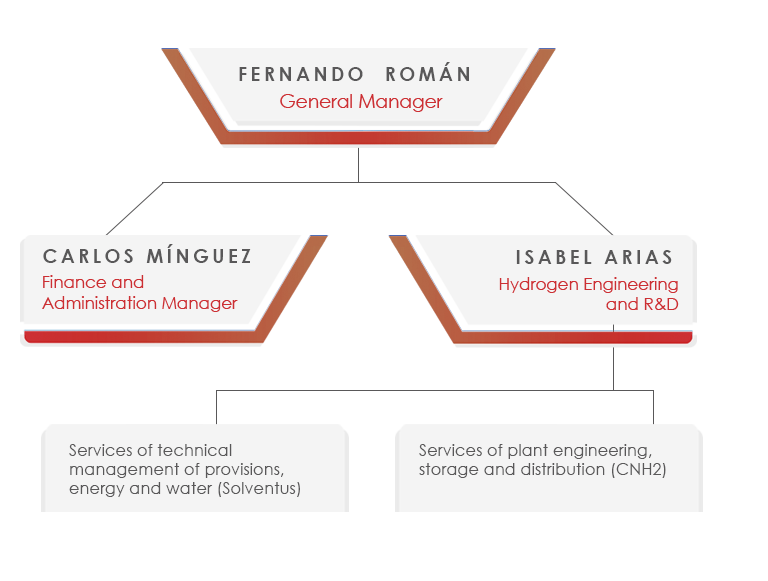 The work team, with experience managing industrial projects and with the support of expert companies, guarantee the technical and economic results in efficiency and profitability for each of the production facilities. Studies of Industrial Engineering, Master’s Degree in Eco-Audits and Environmental Business Planning from the University of Building Engineers in Málaga, studies in Hydrogen and Fuel Cells Processes, Catholic University of Ávila. Since 1989, he has been leading the development of unique projects that finally became sectors of great expansion in the energy market and, particularly, with Renewable Energy: wind, solar photovoltaic and cogeneration in Spain and Chile. Spanish nationality. BA in Business Administration and Management from the University of Castilla-La Mancha, Faculty of Law and Social Sciences of Ciudad Real, Master´s Degree in Financial Management and Management Control – MDFC – by EAE Business School in collaboration with the University of Barcelona. Hydrogen and Fuel Cells Processes, Catholic University of Ávila. Integrated Skills in English ISE I B1. Responsible for economic, financial and administrative area in HOLDING SOLVENTUS SALVADOR SPA, HOLDING INTIHUAIRA SPA, DUX TELCOM S.L., INDHO LTDA and INDHO S.L., group of companies belonging to INAURO INVERSIONES S.L. Before joining in INDHO, she did researches on new materials in the CSIC (Spanish National Research Council) in Madrid until she joined up the photovoltaic sector in 2008 as a R&D engineer on optimizing efficiency and cost of solar cells in Silicio Solar factory. After joining Solventus team in 2013, she has been participating in the construction of PV Salvador, a 70 MW project, being in charge of quality and monitoring activities and EHS in the operation stage. She has a BA in Physics from the Complutense University in Madrid, a Master´s degree in Renewable Energy and Energy Efficiency from San Pablo-CEU University and a Master´s degree in Integrated Management Systems and Corporate Social Responsibility from the Escuela Bureau Veritas Business School. Fluency in German and English languages.